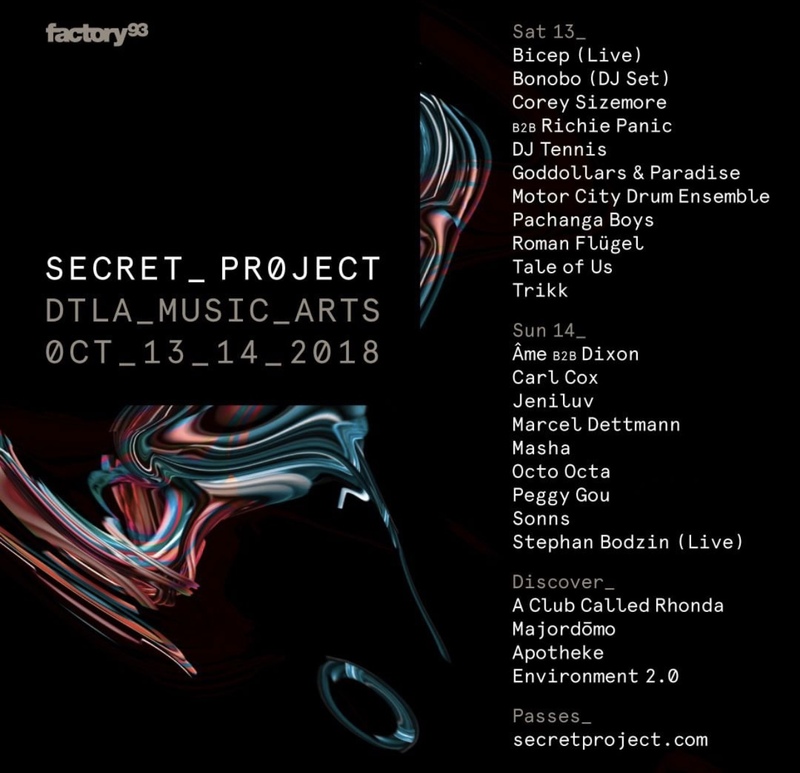 Dedicated to presenting and preserving the avant-garde and esoteric strains of electronic music, in the unique, outdoor setting of Downtown Los Angeles, Secret Project makes its debut Oct. 13-14, with a stacked lineup : Ame b2b Dixon, Bicep, Bonobo, Carl Cox, Corey Sizemore b2b Richie Panic, DJ Tennis, Goddollars & Paradise, Jeniluv, Marcel Dettmann, Masha, Motor City Drum Ensemble, Octo Octa, Pachanga Boys, Peggy Gou, Roman Flügel, Sonns, Stephan Bodzin (live), Tale of Us, and Trikk. Factory 93 will also be bringing some unique experiences to the art-filled space, partnering with Club Called Rhonda, get ready for a groovy weekend of music and chill vibes. If you want to take your Secret Project experience to the next level, VIP is a must! Long known among New Yorkers for its apothecary-themed craft cocktails, Apothéke will be pouring their wellness-minded botanical infusions in the VIP area. Discover Naude Street with Secret Project Oct. 13-14, see you guys there and check out the trailer below. For more info and tickets head over to www.secretproject.com!